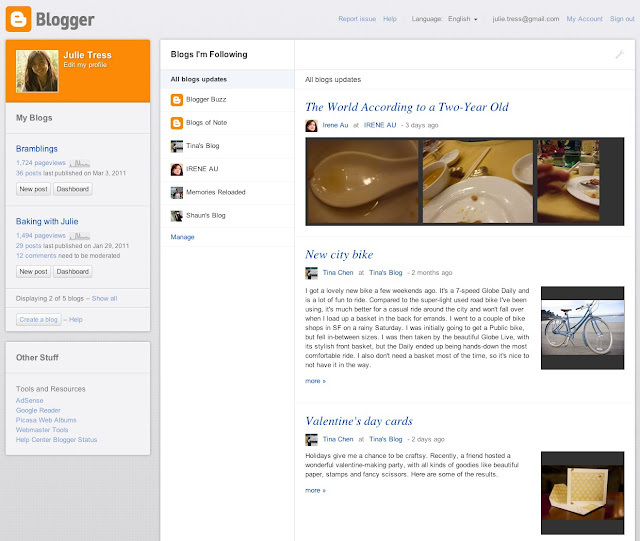 As I posted before about what's new with Blogger in 2011, Blogger will make some make over, including Blogger Dashboard design. Yesterday, Blogger team has launched new Blogger dashboard design. It's easy, just go to http://draft.blogger.com . But please be patient because at the start, only some of lucky Blogger user can see the new design on Blogger in Draft. Blogger team promise, the next few days and weeks this new design will be ramping up to support all Draft users. There is no sign-up or activation process required from your side; just wait, and you’ll notice your dashboard has changed to the new design when you log in to Blogger in Draft. Here new Blogger dashboard design. If you're the lucky one, please share your experience here. ya bentuknya sangat simple, tapi kalo dikembangin lagi akan lebih komunikatif. Thank you for giving time to write this post.